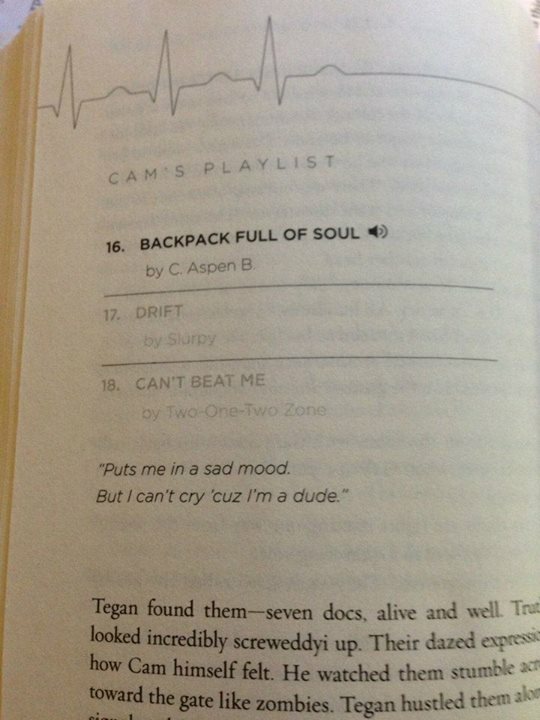 Each chapter of The Terminals starts with a “song” from main character, Cam Cody’s playlist. Now you can get creative and have some fun. 1) Pick your favorite title. 2) Write a cover song. 3) Post it on YouTube. 4) Send the link here. If approved, it’ll be linked to this website with the following guidelines. – Must be original work. – Band names, titles & lyrics in The Terminals are copyrighted & belong to Royce Buckingham. – The tune you create (the music, not the words) belongs to you. – Offensive material may not be approved. Need an Example? Check out Backpack Full of Soul by C Aspen B. “Hello, I’ve got some news for you. in a good way, in a good way, in a good way. or that snap of me on my bed. Chapter 16 – BACKPACK FULL OF SOUL by C. Aspen B. “Puts me in a sad mood. “We’re young, strong, and burn half as long. “My better self is on the shelf. “I been to Paraguay, Uruguay, far away.